Buy The Lonely Screams book now! There are those among us who carry a hidden burden, the burden of loneliness. Though you may not hear it, the lonely scream, they want to be noticed, to be helped, and to be loved. Yet they often suffer in silence. 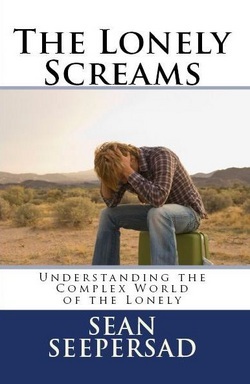 The Lonely Screams is a book that provides a voice to the lonely. In it are 18 autobiographical stories of loneliness. These stories come from a broad cross-section of people of varying ages, experiences, and countries of origin who visited the Web of Loneliness website. The stories include a childhood of bullying and abuse, the desire to love and be loved, a loveless marriage, life after divorce, a broken heart, being gay, coping with social anxiety, and a lifetime of insecurity. Accompanying each story is an insightful guide that seeks to answer two questions: 1. How did each of these individuals end up in the current situation that they are in and 2. What things might each individual do to change their current circumstances and overcome their feelings of loneliness? If you are lonely, if you are looking for answers and insights into your life experiences, and looking for a way out, The Lonely Screams is also for you. Take solace in knowing you are not alone in your loneliness, others suffer the way you do and have walked in similar paths. Find your voice among the screams of the lonely. After reading the book, connect with others who have read the book as well and share your experiences and your thoughts.